It’s been a long summer in Chicago. We’ve been burning up since St. Patrick’s Day when temperatures hit 81F at O’Hare, marking it the warmest leprechaun celebration in 141 years. I’m done with shorts, baseball and the beach. Bring on jeans, football and a pumpkin patch…and having my boys back in school. When I ordered lunches for my youngest a few weeks ago, I noticed a major difference in the offerings. Descriptors such as whole grain, low fat and grass fed showed up all over the menu. Since last year, his parochial school has been compliant with federal regulations all public elementary schools must now follow regarding milk: all white milk must be either fat free or low fat and flavored milk can only be fat free. There are no stipulations on calories or sugar levels. 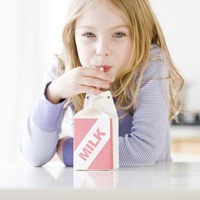 According to Julie Buric, vice president-marketing, Milk Processor Education Program (MilkPEP), “The nation’s milk processors have been hard at work over the past several years to lower the calories and sugar in school flavored milk, giving kids the taste they love while still maintaining all of its essential nutrients. Milk processors: congratulations on a job well done! Survey, milk consumption in schools declined for the third consecutive year, decreasing by more than 1% in just the last year alone. It is imperative that the choices offered to kids are delicious, which not only includes great-tasting flavor but also being served at refrigerated temperatures. 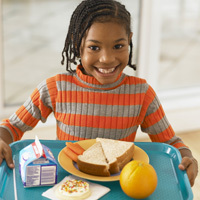 Flavored milk is the most popular choice in school lunch rooms and research suggests students drink less milk when it is not offered --contributing to the detrimental decline in milk intake. Buric says that for many moms, flavored milk on the menu represents an important choice for their kids. Four out of five moms (79%) believe kids need healthy choices at school, including chocolate milk. ﻿As academic institutions across the country gear up for back-to-school, foodservice suppliers have started showcasing new meal solutions to address the increasingly popular Meatless Monday, which many campuses recognize. It is important that milk and dairy products marketers emphasize the important role their offerings play in this movement. For the most part, Meatless Monday is not a vegan agenda; rather, it’s an effort to help Americans reduce their consumption of animal meat. 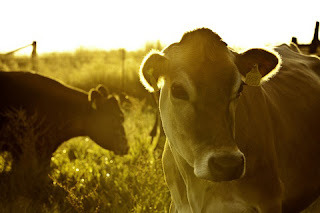 It is theorized that by cutting out meat once a week, a person can improve their health by reducing saturated fat intake and improve the health of the planet by reducing their carbon footprint, as animal farming is one of the largest generators of greenhouse gas and users of fresh water and fossil fuel (more on this later). Meatless Monday purists will also avoid foods with animal origins, such as milk and eggs, but for the average consumer (which is the majority), the focus is on avoiding meat. It’s no wonder that a number of meat substitute manufacturers include dairy ingredients in product formulations, as they recognize the value they provide in terms of appearance, flavor and even nutrition. For example, The Food Collective, Irvine, Calif., markets a line of meatless burritos that contain real cheese. And Lightlife Foods, Turners Falls, Mass., long a leader in refrigerated vegetarian foods, is now in the frozen foods business, with many of its new products relying of dairy ingredients. 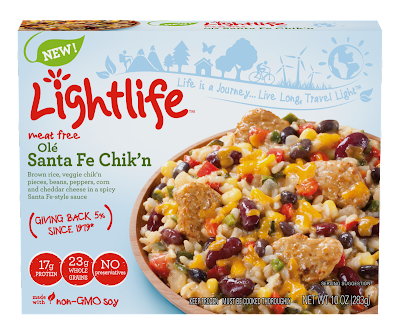 The Olé Santa Fe Chik’n heat-and-eat entrée includes cheddar cheese, sour cream and cream cheese. Dairy marketers would be wise to promote how a glass of milk provides some of the missing nutrients in some meatless meals. Another option is to make a dairy product the protein component of the meatless meal. Think gourmet grilled cheese sandwiches, yogurt-based corn chowder, and how about a salad topped with a scoop of cottage cheese. Further, dairy ingredient suppliers should be promoting their protein offerings as a solution for boosting the protein in Meatless Monday-style prepared foods. Not only do dairy ingredients contribute high-quality, complete proteins to the formulation, some also provide desirable functionalities. For example, whey proteins assist with binding ingredients in veggie burgers and other meatless center-of-plate alternatives. Now back to the carbon footprint reference. In case you were not aware, in a July 25th internal newsletter, USDA urged its employees to support the Meatless Monday movement in efforts to reduce environmental impacts in its cafeteria. This announcement caused uproar among the farmers and ranchers that the agency advocates and who produce food for its cafeteria. USDA, after immediate and significant pressure from the National Cattlemen’s Beef Association (NCBA) and other grassroots producer groups, retracted the statement, saying it had been released in error “without the proper clearance.” You can read NCBA’s statement HERE. One simple way to reduce your environmental impact while dining at our cafeterias is to participate in the “Meatless Monday” initiative http://www.meatlessmonday.com/. This international effort, as the name implies, encourages people not to eat meat on Mondays. Meatless Monday is an initiative of The Monday Campaign Inc., in association with the John Hopkins School of Public Health. How will going meatless one day of the week help the environment? The production of meat, especially beef (and dairy as well), has a large environmental impact. According to the U.N., animal agriculture is a major source of greenhouse gases and climate change. It also wastes resources. It takes 7,000 kg of grain to make 1,000 kg of beef. In addition, beef production requires a lot of water, fertilizer, fossil fuels, and pesticides. In addition there are many health concerns related to the excessive consumption of meat. While a vegetarian diet could have a beneficial impact on a person’s health and the environment, many people are not ready to make that commitment. Because Meatless Monday involves only one day a week, it is a small change that could produce big results. Did you notice that our cafeterias have tasty meatless options? So you can really help yourself and the environment while having a good vegetarian meal! Dairy was mentioned, but parenthetically, thankfully. And the NCBA did a great job defending animal-derived foods. But the Meatless Monday movement is not going away. In fact, it is gaining traction, in particular in foodservice (as exemplified by USDA’s newsletter). Let’s make sure dairy products are recognized as a nutrient-packed food option on Monday, and the other six days of the week. Sodium, when paired with chloride, makes table salt, an ingredient that not only enhances flavor but also performs various functions in different applications. Table salt also happens to be the chemical reference used to demonstrate the taste of salty, one of the five basic tastes, which includes bitter, sour, sweet and umami. 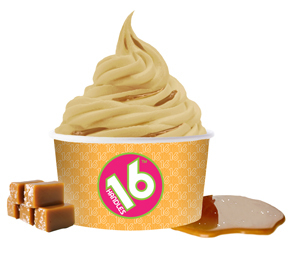 Take for example the new low-fat Salted Caramel frozen yogurt that launched this week by 16 Handles, one of New York’s premier self-serve frozen yogurt chains. 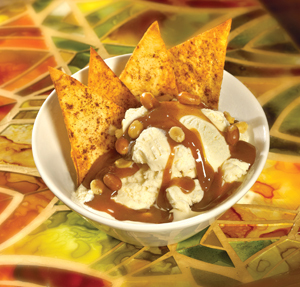 The hint of salt is that layer of deliciousness that turns the sweet taste of caramel into a culinary delight. This better-for-you indulgent snack and dessert combines sweet with salty to offer those who crave these two basic tastes an all-in-one experience. So at a time when overly salty processed food formulators are trying to make significant reductions in sodium levels to accommodate federal nutritional recommendations, others recognize the opportunities a dash of salt brings to the finished product. Today it is readily available. It is also a hot button in the food formulating world as marketers try to provide consumers with products that contain reasonable levels of sodium. This is true for a number of dairy products, including natural cheeses, processed cheeses, dips, dressings and spreads. The good news is that there are a number of ingredient technologies available to get sodium contents to a level (on a per-serving-basis) that does not raise any red flags with label-reading consumers. At the 2012 IFT Annual Meeting & Food Expo held at the end of June in Las Vegas, a number of suppliers showcased their sodium reduction technologies. A few even provided dairy prototypes. One technology really stood out, as the company gave me a blind taste test of a regular cheddar cheese and 1/3 less sodium cheddar cheese made with its unique single-crystal potassium chloride. It was impossible for me to differentiate the two, and then when pressed to pick my favorite, I picked the lower-sodium prototype. I was impressed. Cheese makers know that reducing sodium is not just about taste, but also function. Both sodium and potassium work similarly in that function, which is to manage moisture to reduce microbial growth and control the onset of pathogens. Traditional potassium chloride contributes undesirable bitterness, but this specialty ingredient, as well as some others in the marketplace, seems to be able to do the trick. It maintains that deliciousness we have come to love and enjoy in cheese. There’s one more ingredient that recently caught my attention. It is made from a proprietary, whole milk-based fermentation process and naturally amplifies the perception of salty and other savory nuances in various dairy-based applications (among others). It also makes flavors taste brighter and enables flavors to linger, allowing the consumer to enjoy the product a little longer. In fact, in dairy-based dips and dressings, or processed cheeses and cheese sauces, instead of providing an upfront salty hit, it yields a richer, more rounded flavor, often an improvement to even some traditional, all-salt formulations. With so many ingredient technologies available, formulators should be able to lower sodium contents while keeping dairy products delicious. Remember, consumers need to taste to believe. Reformulate and sample…and simply point out the reasonable sodium content of the product. Flagging sodium reduction on the package’s primary display panel can sometimes bias the consumer, bringing back bad memories of lower-sodium products from years past…ones that were anything but delicious. What More Can You Do With Chocolate? Many readers ask for predictions or suggestions as to what they should be creating in their R&D labs. As a trend tracker for almost 20 years and a frequent trade show attendee, I often have some worthwhile ideas, I’d like to think. Here’s one: Chocolate. It’s time for dairy processors to do more with it. Cocoa and dairy have always made a great couple. Think milk chocolate and chocolate milk. It’s truly one of the few balanced relationships out there. Balance is often boring so why not shake things up. I recently wrote an article for Culinology, the Research Chef Association’s publication, on the innovative ways to cook with chocolate—beyond dessert. I highly encourage you to read it HERE. And earlier this week, The Food Channel released its trends forecast specific to chocolate, identifying the top-10 trends in the category. You can read it HERE. The report identifies make-at-home Craft Chocolates as a top trend, along with Spreadable Chocolate and Chocolate Pairings. It looks at the health factors that are influencing the world of chocolate, and the way chocolate is popping up in unexpected places, like for breakfast. Each trend has a recipe example created in the Kitchens of The Food Channel. Recipes include Biscuits and Chocolate Gravy, Chocolate Blackberry Bark, Chocolate Cinnamon Cream Pie, Gluten-free Chocolate Cookies and more. The report provides some innovative ideas that can translate into dairy products. To all those dairy product manufacturers reading this, it’s time to start bugging your chocolate inclusion suppliers to make these flavors. To those suppliers reading this, I look forward to some samples. I’m tired of negative news. I am especially tired of negative news on the fast- and quick-foodservice industry. This week alone, the commander of the “food police,” Michael Jacobson, executive director of the Center for Science in the Public Interest, wrote a column in the Huffington Post criticizing the Olympics for allowing McDonald’s (among other food and beverage companies) to be a sponsor, as he believes the sponsorship provides overweight consumers permission to fill up on Big Macs. “They reach millions of eyeballs with their seductive TV ads, and they know that some of the squeaky clean, healthy images of star athletes will rub off on their sooty reputations,” says Jacobson. Excuse me, Mr. Jacobson, McDonald’s is all about choice. Don’t forget, the menu also has yogurt parfaits, low-fat milk and some really yummy salads (that include cheese!). As a mom with boys in travel sports…I love McD’s (and most other) drive-thrus. And when we have 10 extra minutes, sitting down at Subway is like five-star dining. We make smart choices. But now I congratulate Chipotle, a recognition that is long overdue. Back in June, the company announced that it reached an important milestone in its efforts to serve sour cream and cheese made with milk from pasture-raised dairy cows. Unfortunately, this “positive” news was ignored by most media outlets, as they preferred to continue to dig into pink slime. Chipotle has long believed that animals should live in a way that allows them to display their natural tendencies. In addition to its commitment to serving dairy from pasture-raised cattle, Chipotle also serves all naturally raised meat--from animals that are raised in a humane way and never given antibiotics or added hormones--in all of its restaurants. Daisy Brand supplies Chipotle the sour cream. It is made from milk from a network of dairy farms that follow Chipotle’s pasture-raised dairy protocol stating that the dairy cattle must have regular access to pasture and that all natural resources, including plants, soil and water, must be sustainably managed. The animals must also have access to shelter, housing or windbreaks that provide adequate protection from the elements. In addition to its sour cream, 65% of the cheese served at Chipotle restaurants is produced with dairy from pasture-raised cows. And, Chipotle remains the only national restaurant chain with a significant commitment to local and organically grown produce. I just wish they had a drive thru. By the way, did you know that Chipotle would likely not be the success it is today without the help of McDonald’s? That’s right. In 1998, McDonald’s made an initial minority investment in Chipotle, and by 2001, the company had grown to be Chipotle’s largest investor. The investment from McDonald’s allowed the firm to quickly expand, from 16 restaurants in 1998 to more than 500 by 2005. On January 26, 2006, Chipotle went public. In October of that year, McDonald’s fully divested in order to focus on its namesake chain. Thanks McDonald’s.